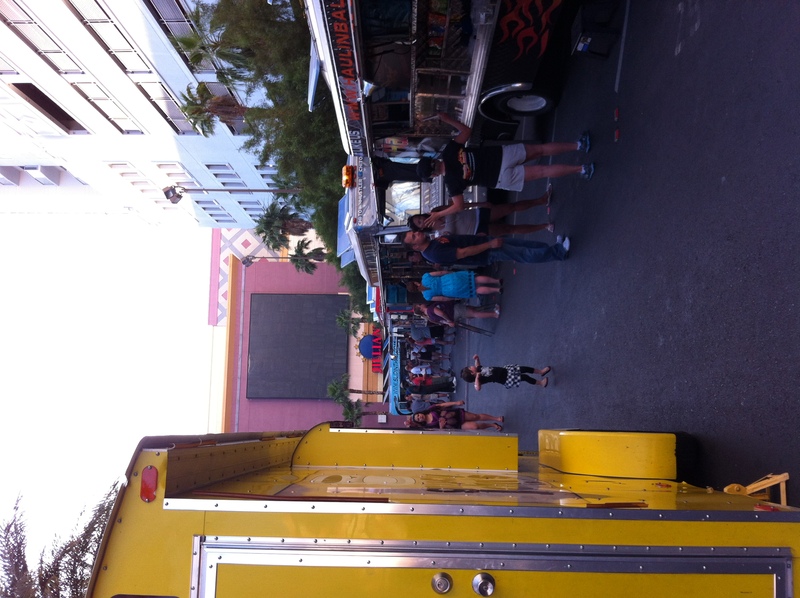 A food truck Festival held monthly at the El Cortez on the 2nd Saturday of the month from 6pm – 1am. I have been trying to attend this event since it started, but something always seemed to come up and I missed it. But this month my friend and I made a conscious decision to attend on May 12th. You can follow them on twitter @VegasStreats for up to date information of which trucks are signed up to be at each event, this is kind of nice if there is someone in particular you want to try. The downside to this festival is that it is down town on 6th street, which means you have to pay for parking at the meters or Neonopolis because the El Cortez Parking garage was closed to everyone but hotel guests. But this isn’t a direct reflection on their event it is just a black mark on downtown Las Vegas in general; as locals we hate having to park down there because it is a nightmare & we are spoiled with not having to pay for parking anywhere. We got to the event a little before six which is when it starts so we had to wait in line to get in, which wasn’t too bad. Once we got in my friend and I took a tour around the place to see all the food trucks that were there. We noticed that not everyone had a truck that their were tents set up for other food vendors; like a cupcake stand, funnel cakes & a tent with curry dishes. We did have a hard time deciding what we wanted, because there is a lot of choices and at the time we weren’t sure what we were craving. First thing out of the gate it would’ve been nice if each truck ran a special on a signature item, so that maybe you could go to more than one truck for the cost of one or two meals. It seemed to me that the prices were the same as if I just came across the truck on the street. I understand that it is a business and they have expenses but at an event that focuses on diversity of food choices I would think that they would want you to try all the trucks not just one or two. So I am gathering that if you go with a group and people are willing to share this would be the only way to really try all of the trucks on a friendlier budget. You want to get your monies worth and not feel like it was a waste. 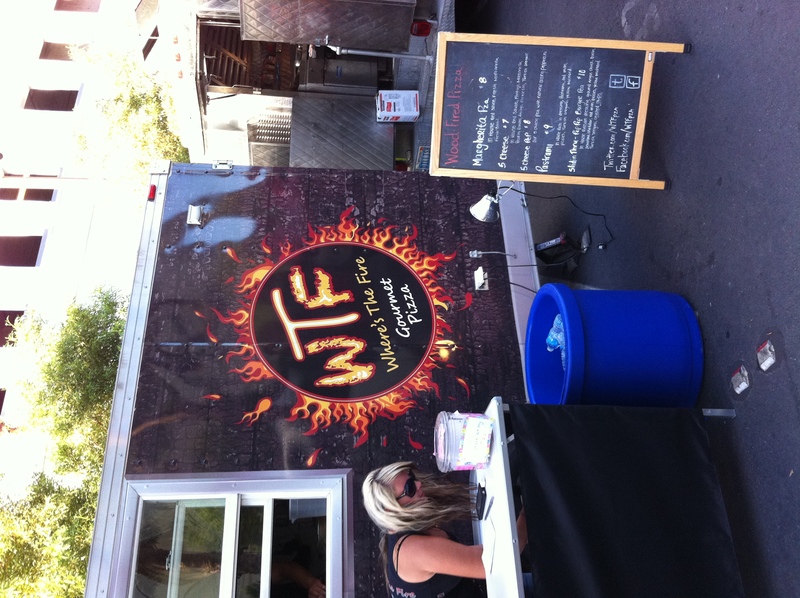 We ended up choosing WTF – Where’s The Fire truck, it is a pizza truck and they even have the fire oven in their truck to cook the pizzas. This was a nice addition, but I do feel sorry for the cooks because that has got to be uncomfortable in there. 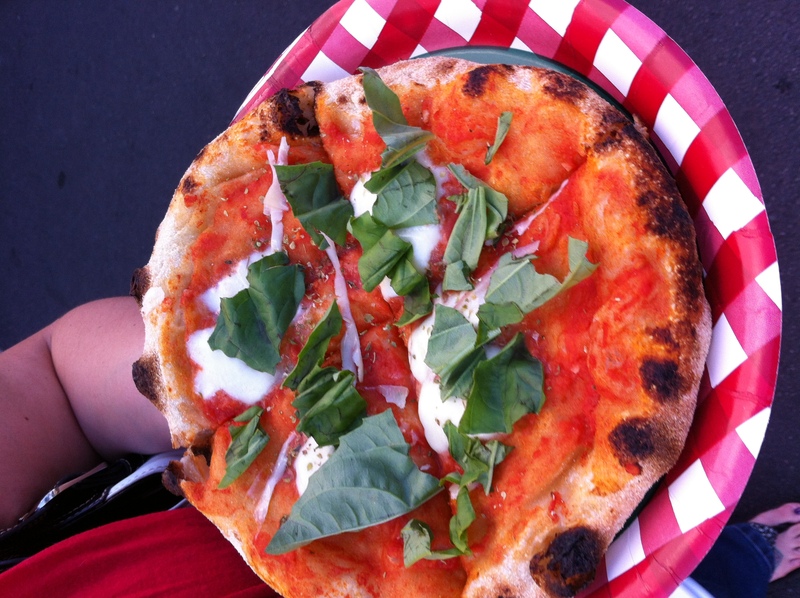 My friend went with the Margherita pizza; red sauce, fresh mozzarella & fresh basil. From the looks of this pizza it could have used a lot more cheese, it was mainly crust and red sauce. Which I gather the margherita pizzas normally have less cheese than a traditional pizza, but this was really lacking for the personal size pizza. But it was still a good pizza, the crust was nice and crunchy yet soft and chewy; the perfect balance. 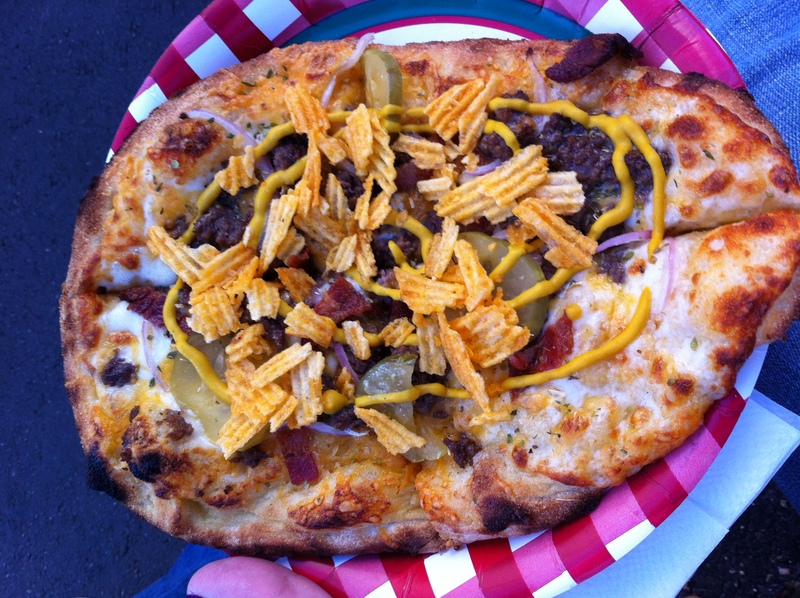 I decided to be a bit more daring and went for their special pizza for the night that was called Slidin Thre – Pep Pep Burger; it was a pizza that had in-house russian dressing, provolone, cheddar, ground chuck, bacon, red onion, pickles & finished with oregano, yellow mustard & crushed chips. I figure it is go big or go home kind of night. Despite how interesting this pizza looked, it was actually quiet delicious. The crust was cooked perfectly, the mixture of cheese (which honestly I couldn’t taste the cheddar), beef & bacon all blended perfectly together then you get the bite of pickle, mustard & crunch of the chips and it was another pleasant texture and flavor level. I think the pickles & mustard were the two extras that really held this pizza together and if I saw this on their menu again I wouldn’t hesitate to order it. 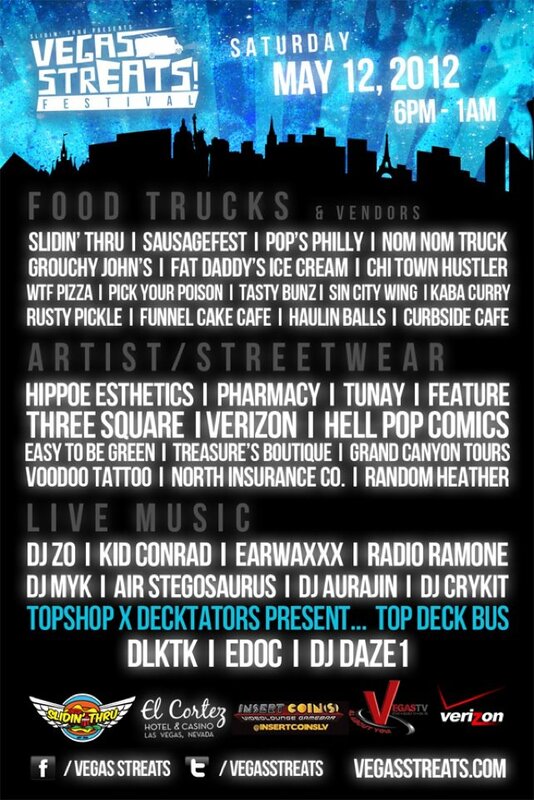 Back to the festival itself, I would say overall if I really wanted to try these food trucks I would hunt them down on twitter and go see where they are in the valley, and not make a special trip down to Vegas StrEATs, for me it just wasn’t all it is cracked up to be. Maybe I came to early and I should’ve waited until the night time when the DJs really start going, but I was bored after only being there for just over an hour. There is only so many times you can walk up and down the food trucks before you have seen it all. My biggest complaint was that the trucks weren’t running any specials like I said earlier it would’ve been nice to see smaller portions & prices so you can try more than one truck with out feeling like I just emptied my wallet on the ground. So for me I don’t think I will be making the trip down there again unless someone I knew really wanted to go. But I would say if you are in the area and come across it, it wouldn’t hurt to take a look around. It is free to get in and who knows you may just find a new favorite food truck. A view of the truck line up.